I remember back in 2012 when I made my dad buy a Honda City for highway use. You know a smooth powerful engine, safety of ABS airbags, comfortable back seats and many stuff were in its favour. After some trips, I realized that when full packed with luggage and passengers, its underbody touches every large pothole and speed breaker. Then I knew why a high ground clearance SUV is so important especially in India even with all its small demerits of weight, body roll etc. Not to our surprise, this segment of compact SUVs grew by more than 40% from last year as people want a practical car with an additional feel good factor of dominance associated with SUVs. 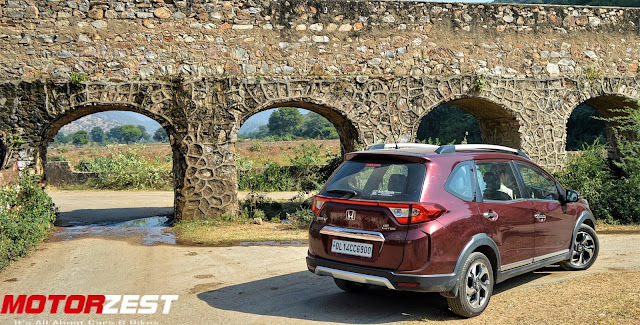 The major chunk of the sales of this segment were mostly enjoyed by Renault Duster and then came the Hyundai Creta so Honda finally decided to come up with their take in the form of BR-V. Not only is this the first diesel SUV by Honda but it has a distinct advantage of the first-in-class 7 seats configuration. So people might think, Is BR-V worth the cost or its just a bigger 'not so successful' Mobilio. Lets find out. As soon as I was handed over the keys of the top-end BR-V VX diesel variant, I noticed how smartly the front end is designed and to be fair ,it does the most justice to BR-V's claim of being an SUV. 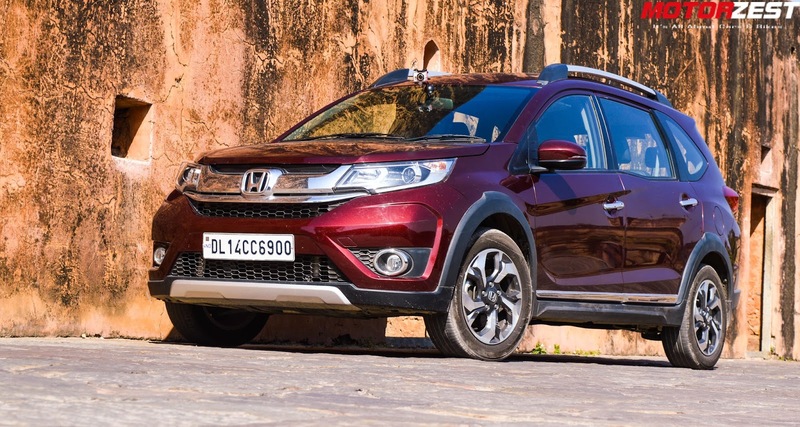 The raised bonnet, projector headlamps (standard all variants) with LED strip , the thick band of chrome with Honda badge , honeycomb grill, faux aluminium skid plate, chrome surrounded fog lamps etc all give BR-V a very appealing fascia. 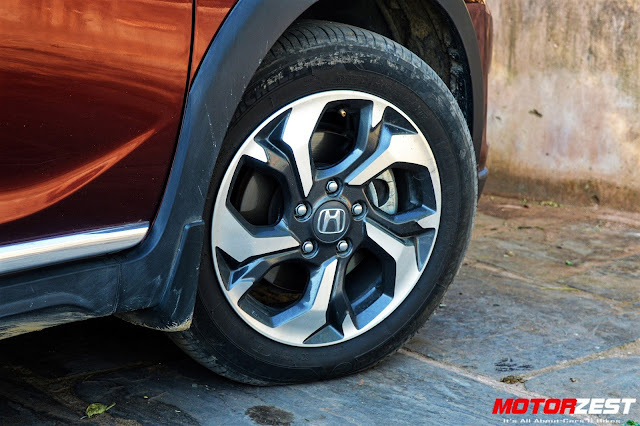 When I moved to the side, it was clearly evident that by giving roof rails and black cladding over the wheel arches, Honda tried very hard to give it a SUV stance but this angle show its MPV like silhouette the most. The BR-V looks very stretched out and low despite having 210 mm of ground clearance which is surprisingly more than Creta(190mm), Ecosport (200mm) and even Duster(205mm). A little kink in the window line also reminds me of the Mobilio but that is a clever functional touch (more on this later). Move to the rear, it continues the same story but the brake light looks very contemporary as the connected reflector runs across the tailgate. What is worth mentioning are the 16" inch alloy wheels which looks absolutely stunning. In the parking lot, after opening the door easily with keyless entry and adjusting my driving position by manual seat height adjuster and rake only adjustable steering wheel, I pushed the start/stop button and slotted the reverse gear. To my surprise, I found that there is not even a parking sensor on a 14 lakh 4.5+ meter SUV! (parking nightmare). Neverthless, I managed somehow and saw there are many usable things missing like a touchscreen (even in Kwid) or a CD player. 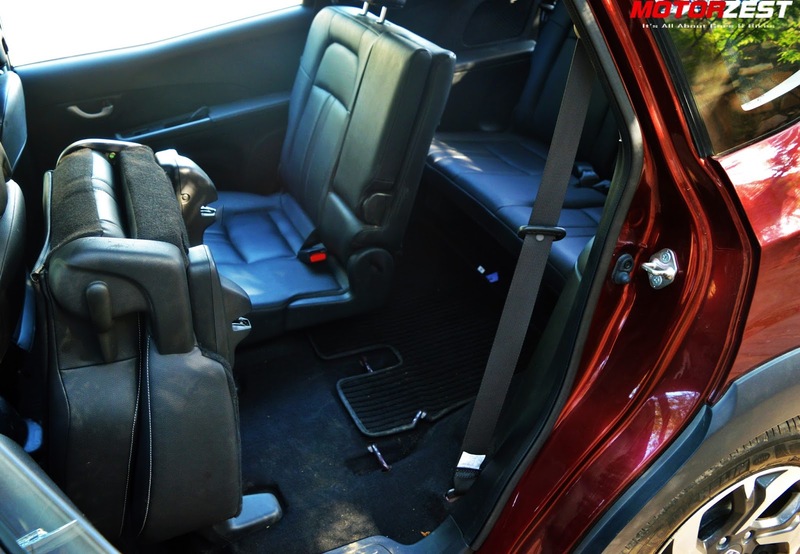 What I liked though are the looks of all black interiors lifted from the new Amaze. 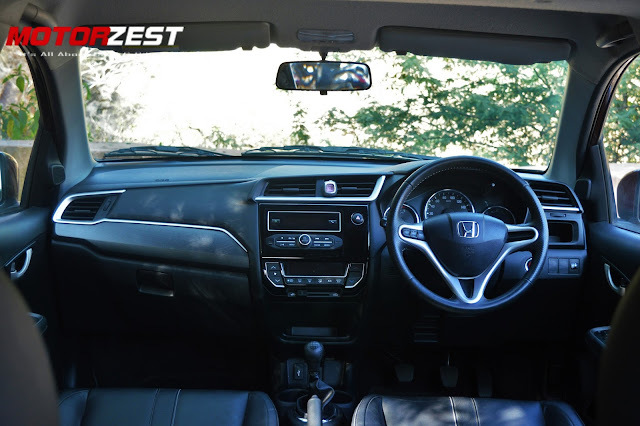 Surely, it looked classy with the carbon fibre like finish over the glovebox and contrasting aluminium colored creases but Honda City's interior would be still better on this premium priced car. Other features like Automatic climate control, bluetooth telephony, steering mounted audio controls, electrically retractable ORVMs etc are all present and all the controls felt very tactile and ergonomic to use. How suitable for city driving ? Driving through Delhi's chaotic traffic revealed that the clutch is decently light and like other Hondas, this I-DTECH motor is very tractable and picks up speed from as low as 1500 rpm so puttering around in city isn't that tedious as in other diesel SUVs. Sometimes, I felt the first gear too short to my liking so I pulled it from standstill in 2nd and it never hesitated! 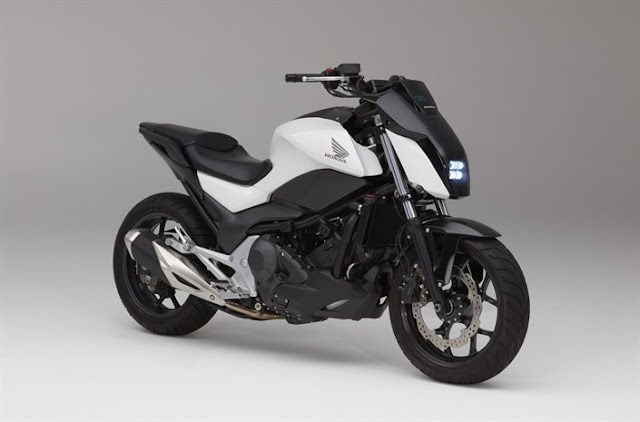 The diesel clatter for which Hondas are known for, was present but Honda have really worked on this as here, it was the least in its lineup. The steering was light to maneuver and it felt as I was driving a car rather than SUV and that's not always a good feeling. What's disheartening though was the feel from driver's seat as the dominance factor which I talked about earlier isn't there. It feels quite low for an SUV and I was sitting as low as some other hatchbacks on the road. The visibility was nice as the glass area all over the cabin is huge and there was no problem in city even with its massive length. Now what is a road test without a highway trip? So we decided to hit the highway to stretch BR-V's legs and see how it behaves on a trip. We packed our bags and opened the tailgate. 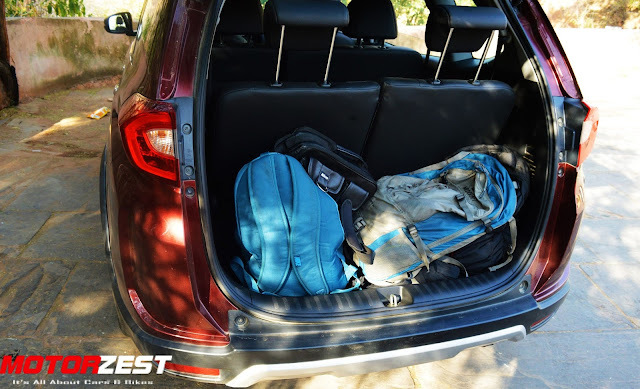 It was impressive that even after 3 rows of seat, the remaining boot was fairly spacious at 223 liters but if you want even more space then the rear seats fold and flip to give a whooping 691 liters of boot space. It has a very low loading lip too, good job! Now I decided to check the middle row seats when we started the trip. For a 6" ft tall guy, the knee room is more than adequate and I could easily increase it further by sliding the seats back but what made it utterly comfy is the reclining seat feature. Now that kink in the window line plays its part to make the cabin area feel very airy and the roof mounted air-con vents with fan speed control is keeping things cool too. The under thigh support ,width of the cabin and low sloping center armrest isn't great but the cushioning and aforementioned reclining feature made me sleep comfortably after sometime. Honda haven't skipped the last row of seat in terms of functionality either as they get proper adjustable headrests, seatbelts and separate bottle holders on the armrest. The head and legroom (can be increased by sliding middle seat forward) is tight for a tall guy and I was sitting knees up but for an average Indian adult or kid, space is not an issue. I found the ride quality definitely bouncy from the last row of seats but from the front 2 rows, it was surprisingly plush. Unlike the Amaze and Mobilio, the suspension setup of BR-V feels absorbent and I didn't find myself tossed around on high speed bumps. 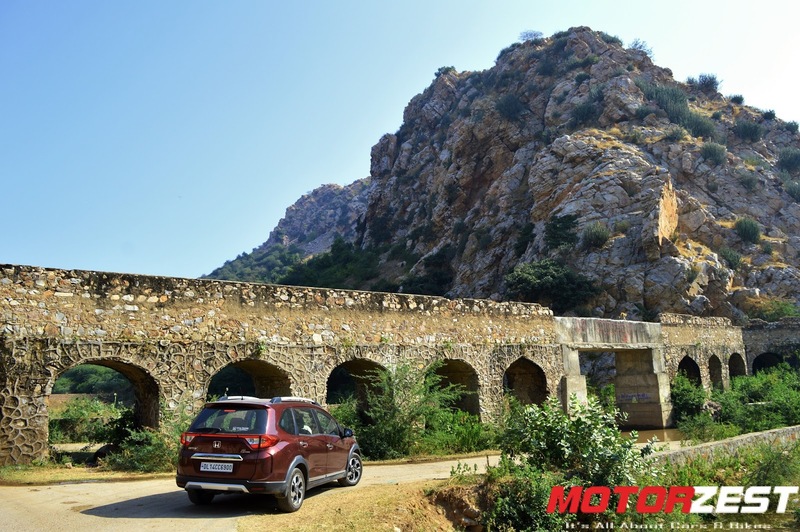 Surely it wasn't as plush as Duster on broken roads but overall its a better setup than Creta which is on the softer side. Now it was my turn to put the pedal to the medal! 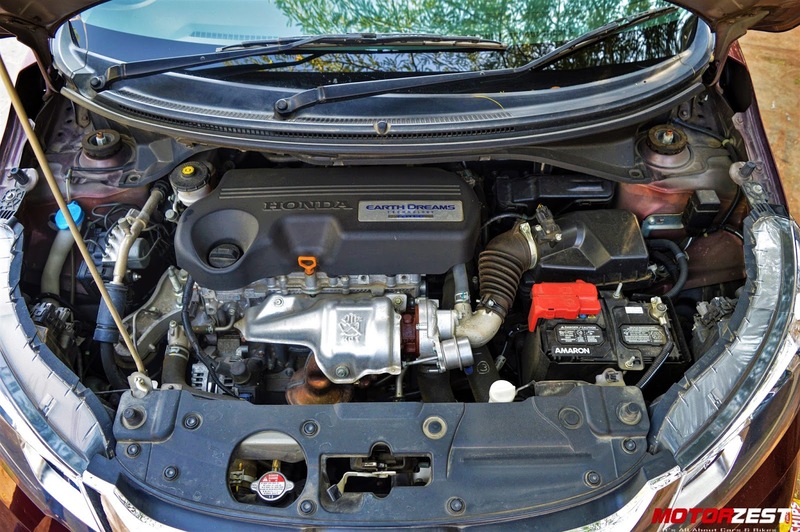 Now the car like feel becomes a boon as the handling of BR-V felt a lot like a low slung car. At triple digit speeds, the steering felt precise and the body roll was also well controlled for the large size of this 7 seater but obviously its not race car flat. I was surprised at the high speed stability of the BR-V and even at illegal speeds, it was well connected to the tarmac. Coming to comfort, the Driver's seat provide nice side bolstering and lumbar support for my long back and the leather upholstery felt great too which, sadly, the top end V variant of petrol automatic lacks. Earth Dreams motor felt refined when cruising but diesel clatter is evident. Thanks to irresponsible traffic on our roads, I had a chance to test the brakes of BR-V. At slow speeds they felt a bit grabby but on highways they prove to be very effective by shedding speeds quite fast backed up by the safety net of ABS which is standard across all variants except base petrol. 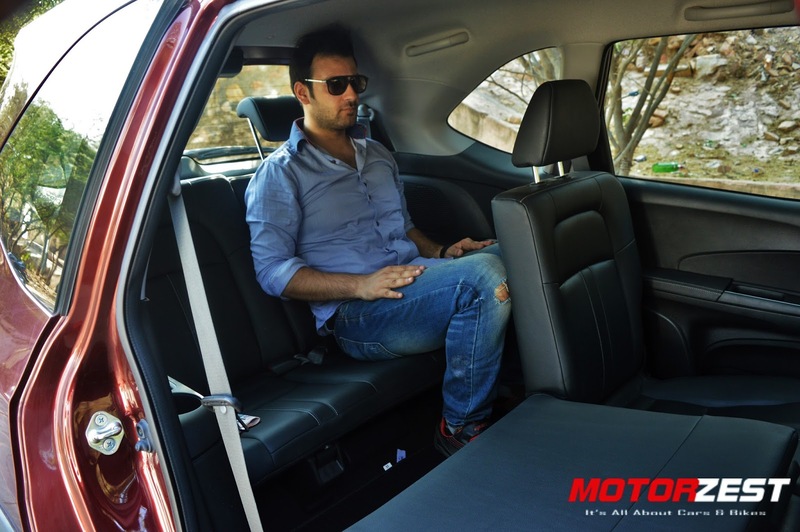 Talking of safety, it also comes with 2 airbags as standard across variants and the BR-V scored 4 stars in ASEAN NCAP crash test, boosting up the confidence factor. Cruising down the highway, the engine felt relaxed and silent thanks to 6 gears but the gears felt a bit notchy sometimes. Overtaking was effortless as the midrange is strong but if you want to know, the 0-100 timing is about 15.5 seconds which is also decent as per the competition. If you are a petrol head, there is always the option of manual petrol motor which claims it in under 11 seconds. The diesel has a clear advantage of fuel efficiency and this earth dreams motor is no different delivering BRV a combined mileage of 17.3 kmpl which is commendable for this size of vehicle and motor. To conclude, the Bold Runabout Vehicle BR-V is definitely a bold move from Honda and I can see many buyers with large families drawing towards it due to 7 seats. Also, the last row stretched it to an extent where it starts to loose its identity of an SUV that can come in the way of its success. My biggest complain from it is the absence of key features like reverse parking sensors and touchscreen, that too in this day and age. To me, its just a matter of heart and mind. 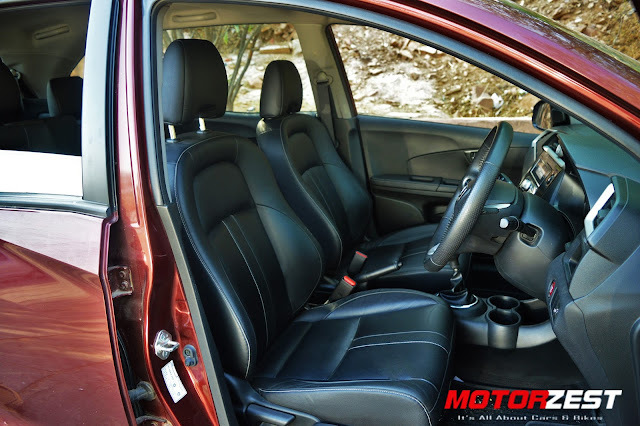 Surely, it wont struck the heart strings with the macho feel of an SUV but as a sensible practical option, large family men will appreciate the space, comfort, handling and highway manners which the BR-V provides. So from that point of view, it is value for money considering its price which is almost a lakh cheaper than its premium rivals.